The tidy rear end is kept that way with a suspended solo seat, chain drive and a minimal swingarm. 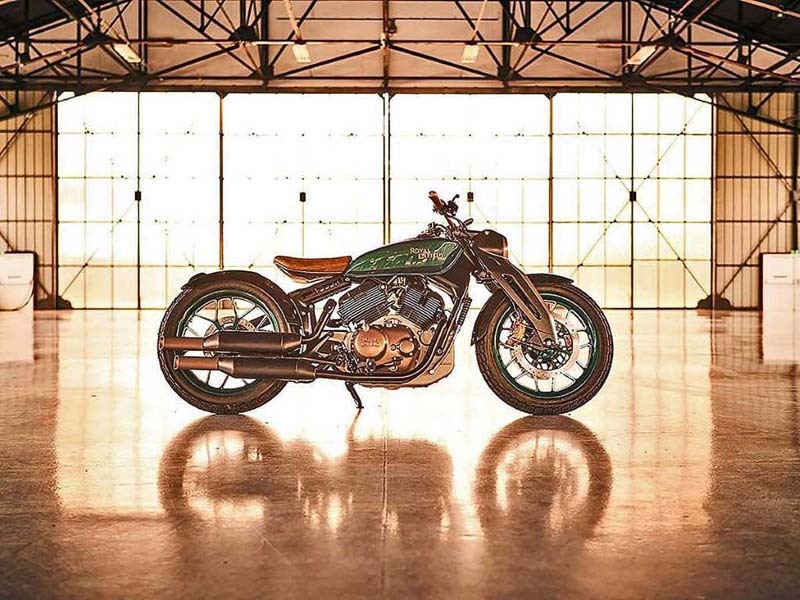 While 350 Singles have long been Enfield’s forte, once upon a time the Indian manufacturer built a stompin’ 1,140cc side-valve V-twin called the KX. Produced in the late 1930s, it remains the biggest engine the company ever made. The KX was quite the bike for its time, its design influencing the direction Royal Enfield took with its KX concept. Between its low-slung frame and twin Maxxis tires, Royal Enfield’s KX concept has a sporty silhouette. A cast aluminum girder anchors its front, a housing for the LED headlight incorporated into its design. A monoshock is tucked neatly beneath the suspended seat while Enfield opted to leave the chain-driven rear single-sided for a cleaner look. 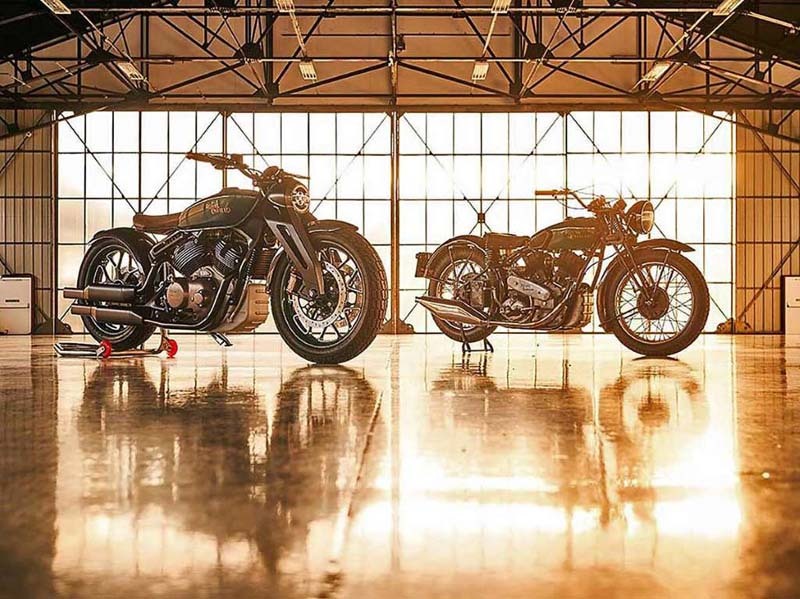 The stacks of the liquid-cooled 838cc V-twin are short and stout, while the exhausts are very Enfield. At the time of its reveal, the engine reportedly was still in the mock-up stage. 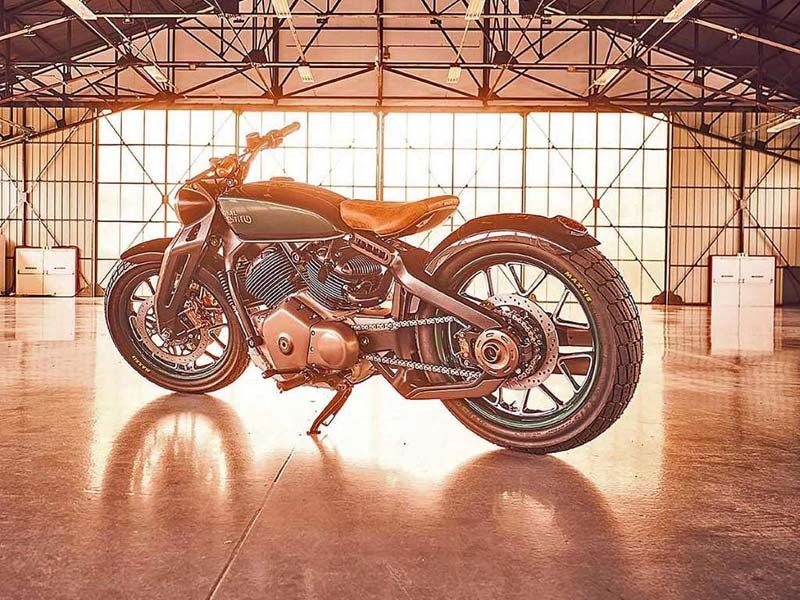 Royal Enfield’s KX concept has more promising features, from its dual radial-mounted Brembos on the front to its tanned leather seat, to the mid controls. Touches of bronze finish and grips wrapped in leather add to its classy cred. Royal Enfield built its KX concept in-house in only six months, just in time for its debut at the 2018 EICMA show. It definitely paints Royal Enfield in a different light, and one that could potentially pique the interest of the American market, but at this time it’s strictly a design exercise. So let’s hope. Royal Enfield’s KX concept thrusts an aluminum girder up front, with what’s apparently a liquid-cooled 838cc V-twin manning the engine bay (the engine is still in mock-up stage).